The number of activities our students get involved in presents quite a challenge in the newsletter. Either I must leave a lot out, or the newsletter becomes very long. While it might not be quite novel length, I am sure I have read longer short stories. You may have noticed that when the newsletter gets too long, it cuts off in the email and you must follow the link to see the rest. We also publish the newsletter on the website if you would like to access it this way. While Book Week will dominate the news here this week, as it should, there are other things going on in the back ground. The preparations for the variety show are in full swing and as you may have noticed there are a number of service activities both on and off campus. I would like to take a moment to thank a few people. All of these activities, and many more such as the Farmers’ Market, Swim Galas and assemblies require a lot of people to make them work. Teaching staff and parents are invaluable in making these happen and deserve our thanks. However, I would also like to note that these events require constant support from our housekeepers, gardeners, drivers and others whose work behind the scenes goes often unnoticed. So, a big thank you to this group. I look forward to seeing everyone at the Book Week activities. Please note that the weekend of February 16th is a long weekend. On that Friday and on Monday the 19th there are no classes. School will finish Thursday afternoon and restart on Tuesday morning. On Sunday February 4th, KCMC will be hosting a Cancer Walk starting at 6am. The walk will go from the Regional Commisioners Office to KCMC. For more information call Mr Kiula P. Kiula at 0754 711 030 or Mrs Evaline Ndosi at 0625 693 412. This charity event tickets cost: 20,000Tsh for VIP, 10,000Tsh for adults and 5,000Tsh for students. The sale will be from 10am to 2pm in Rafiki Hall. 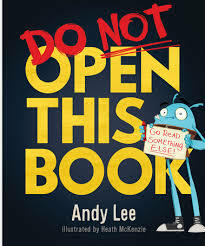 If you would like your child to purchase a book please send in money on Wednesday. We are expecting that most books will run from 10,000 Tsh to 25,000 Tsh depending on the UK prices. If possible could parents come between 11am and 12:35pm as that allows the students easier access during break and lunch. 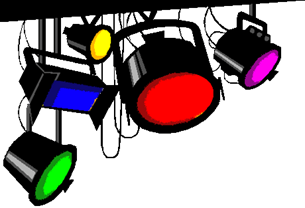 Whole School Assembly – Monday at 7.35 in Karibu Hall. How can I help my child further? By taking an interest in what your child is reading, e.g. asking questions about their latest book etc. Come and see all the talented students and teachers of ISM on stage! This year the Variety Show will take place on the 9th of February 2018. All students and teachers can sign up at the breezeway or near the music room. There will be a restriction on the lengh for each performance, so a pre-meeting with the organizers will take place a few days prior to the Variety Show. The Show will be in Karibu Hall starting at 6.30pm. Entrance for free. Don’t be shy, show off those talents. This coming week D2 students submit their final draft of their Math coursework assignments and they will have oral examinations in several languages. The D1 students have commenced academic coursework in History, Global Politics and several other subjects. In Life Skills students have been exploring the role that the media plays in modern life. Last week, they worked in groups to examine the ways in which the media has constructed cases of sexual misconduct and harassment. This led to insightful presentations (see photo) based around the central questions: Is the media a positive mechanism for the social issues of gender equality? And why does this matter in our lives? Planning has started for the D2 graduation on Saturday May 19th so please keep this weekend free. Plan to attend the last two parent-teacher conferences this school year on Friday March 23 (Quarter 3) and Thursday June 14 (Quarter 4). 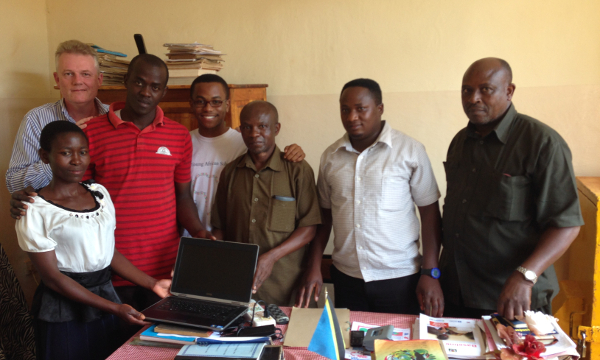 Students from the ISM CAS Committee delivered the first of our donated computers this week to Mruwia Secondary School. Mr. Kusiriel, the school deputy principal, received with gratitude the laptop computer given to ISM to be donated to our local community from Halcón Resources Corporation out of Houston Texas. They have been involved in other support to the school in the past. 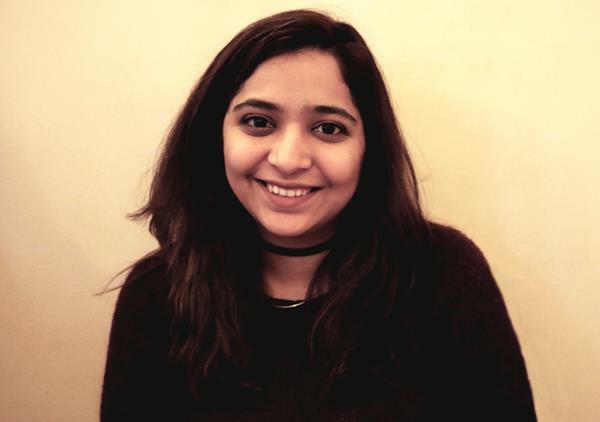 My name is Rabail and I am the new UWC Volunteer at ISM. I’m from Pakistan and attended UWC Red Cross Nordic (Norway) before going to Northwestern University in the US to study film and business. UWC was an amazing experience and has played a big part in making me who I am today. I have stayed involved with it by running UWC short courses and helping with national selections. I’ve had a great time at ISM so far and I’m looking forward to getting more involved and helping with anything I can. I’ll mostly be working on after school activities and would love to help initiate and develop activities you want to do. Please feel free to ask me any questions you may have, or just come chat with me about anything you want. You can find me around campus or email me and we’ll find a time to talk. Looking forward to getting to know all of you. 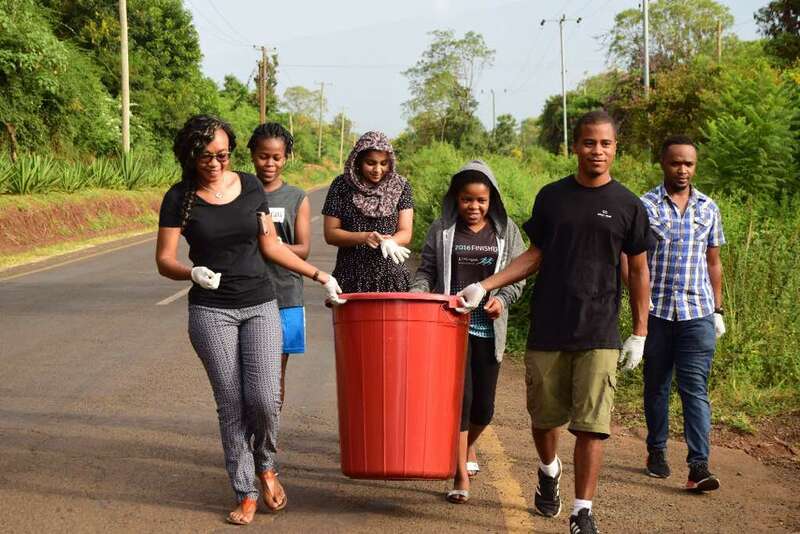 On Saturday morning, the Diploma girls were involved in an environmental cleanup exercise along Lema road, in line with the Presidential directive. This happens each month with a rotation between the secondary boarding houses. There is a variety show planned on campus on Friday 9th February in the evening. This is expected to be a time of entertaining performances from the ISM community. Boarders have started signing up for this day. Kindly mark this day on your calendar. The following weekend from Friday 16th to Monday 19th will be ISM holiday. There will be no classes on Friday 16th and Monday 18th. The boarders have a trip planned for that weekend. They will leave for Pangani on Friday 16th and return on Sunday 18th. This trip is planned for all boarders, but all Primary up to M3 boarders will be expected to go. The trip is free of charge for boarders. Parents who wish to have their children return home that weekend are free to make the arrangements, and let the school know in good time. Please note, however, the boarding houses will remain open for those who wish to stay in school for the long weekend. The first NTAA Tournament which was scheduled for Saturday January 27th at Braeburn has been postponed, these games will be played at a later date. The next NTAA competition for these teams will be Saturday February 10th. 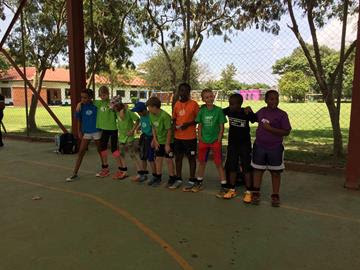 On Saturday February 3rd our Ultimate Frisbee team will take part in an NTAA Invitational Competition. This is the first for the NTAA, hopefully there will be more. Let’s go Leopards. Congratulations to all the children who finished off their summative assessments this week. I particularly enjoyed looking at the P2/3 scrapbooks and the P1/2 models. We have so many creative and talented students. The P6s had a wonderful time on their Exhibition Retreat and have returned full of enthusiasm and ideas. Many thanks to the ISMAC P6 Class for hosting and collaborating with them. 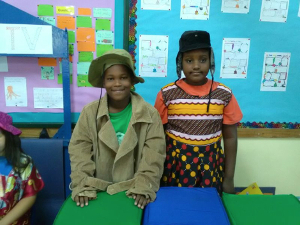 Our students and teachers are now gearing up for ISM’s Book Week. On Monday the children should come to school dressed up as their favourite book character for our Primary Book Week Spirit Day. They can also bring in any unwanted books for our book swap from Monday to Thursday. We are still looking for Surprise Readers. If any parents want to read a story to a particular class, please let me know, or contact the class teacher directly. 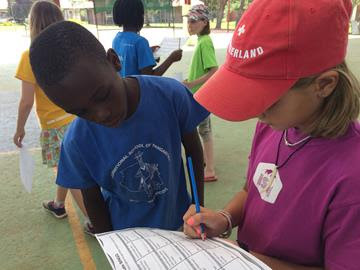 Our volunteer Miss Aisia finished her time with us this week. The children benefited greatly from her brief stay with us, and we wish her all the best as she prepares for the next stage in her education. 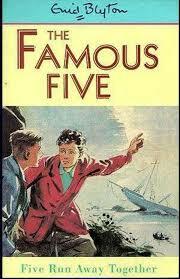 The class have been reading and judging a set of award-winning books and will continue to do so over the next week. This coming week is Book Week. We’ll be exploring our love for reading. Don’t forget to bring your used books (good condition please) for the book swap. Monday is a Spirit Day, when the children should dress as a favourite book character. We will also have three new EC students joining us this week and we welcome them. As we reflected on our unit this week, we concluded that we are all very creative individuals! The pieces of art that we created are ready for you to see. After the whole school assembly on Monday, you are welcome to come in and view our work. Next week, we begin our new unit: How we organize ourselves. Or central idea is communities thrive when people are interdependent and take mutual responsibility. We are looking forward to examining learning communities and how people in them cooperate and collaborate to help a community function. In math, we will be looking at how numbers are organized. We will be reviewing and learning more about place value systems and skip counting. On Friday, we are performing during the primary gathering. Please come and support the children as they keep on nurturing their creativity. Well done to our P2/3 Historians. They presented their scrapbooks with confidence and enthusiasm. Next week is a very busy one. The children begin their fourth unit: Human made systems are carefully designed to achieve multiple purposes. 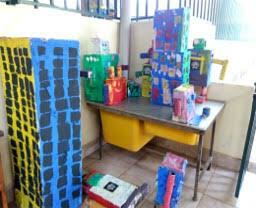 During this unit the children will inquire into different types of transport systems. 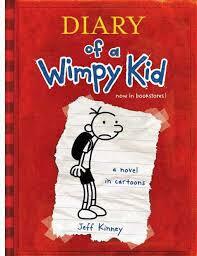 It will also be Book Week and the children will be taking part in many engaging activities. The children will be designing their own Mr. Men character and creating a comic strip to go along with it. In Math, some children will be reviewing subtraction of single and two-digit numbers, others will be looking at 4-digit subtraction. The class will also be looking at collecting and correlating data. In reading, we will continue reading the books that have been selected for Book Week. We will also be reading the Mr. Men and Little Miss series. P3 parents you will notice that your child has started to bring home their yellow notebooks. This is to inform you of what they are learning in class. Monday: Homework goes home. Dress as your favorite book character Spirit Day. Whole school assembly. Bring in any books that you have already read and would like to swap. 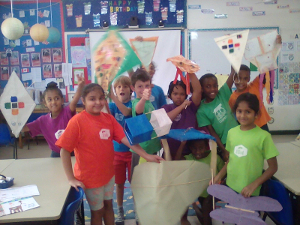 This week we applied all the skills we have gained in the unit and planned, measured and flew our kites. We were challenged to improve our design and add tails and compare different materials which may have had an impact on its ability to lift off. We completed our summative assessments and I was impressed how the children were able to explain their understanding especially well using diagrams. In English we learned how to review other people’s work and tried to give positive feedback. Next week, in math we will continue to solidify our understanding of perimeter and area as some children are finding this concept challenging. The central idea of our new unit is: The exchange of goods and services is complex and determined by many factors. This week the children have enjoyed themselves making video news reports about fairy tales (see photo). We have been exploring the idea of bias and the children have been reporting events from one person’s perspective, leading to a deliberately unbalanced news item. We have been looking at news bulletins to learn how newsreaders interact with the camera, address their audience, introduce items and sign off at the end of a broadcast. Next week is book week and our preparations are already underway. We have been reading books and judging them as part of the Kilimanjaro Book Award competition. We have started decorating our door to look like the cover of the book, “Actual Size” by Steve Jenkins. We will continue with both of these activities next week. Don’t forget that Monday is a special book week assembly, beginning at 7:35, and that the children should dress up as a book character on that day. We will be reading and enjoying books all week as well as participating in all sorts of literature related activities. We need some adults to come into class to read to us. Don’t be shy – we’d love to hear from you! The P6 retreat was a huge success. 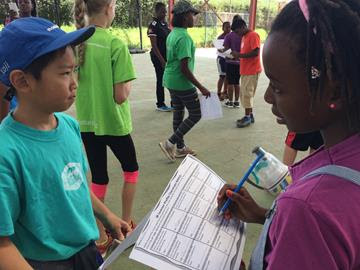 The students bonded through team building games and Exhibition related activities and towards the end you wouldn’t have been able to tell they were from different campuses. A huge thanks to all involved in making this a great success. In the coming weeks, we will be recapping what we learned about the PYP Essential Elements. The students will need to think of two or three issues that they are passionate about before we get into the groups. We will be focusing on the concept of long division and learning about different strategies to solve this during our Math lessons. Students will start from basic sharing and we will build on the concept throughout the week. In Language Arts the students will look at informational texts related to energy conservation and distribution of energy around us. We will be looking at articles in newspapers, magazines and finding information from different sources. The students will learn to find key information and summarise it.